Here follows a shortened history of the Holland America Line in four parts. By no means complete but it gives a general oversight of what happened to the company during the 136 years of its existence. When I do my lectures on board, during the longer cruises when there are more sea days; there is the standard question of how big those ships in the old days really were. Photos do not always show the ships in “size” perspective and paintings and contemporary drawings quite often tend to exaggerate the real size in comparison to any surrounding land or sea craft. Especially as we are now in the days of the Mega liners, it is hard to understand how small the ships were in those early days, nor how many people were “packed” into them. So throughout the following narration of the company’s history with its various ships, I have noted the Space Ratio, of each ship discussed, to indicate how much “elbow” room there was on board. Space ratio is a measure that is used nowadays in the cruise business to indicate the “roominess” of a cruise ship. If applied to the old liners, it does give an idea of what the ship was like, although we have to keep in mind that the interior spaces of those early ships were not evenly divided. First class would get the most, while for steerage or the emigrant class, there would only be the left overs. Still the space ratio does help to understand the size of the ships a bit better. A second issue that often confuses people is the word tonnage. In regards to ships several sorts of tonnage are used but for the Passenger ships the GRT or BRT (Gross Register Tonnage or Bruto Register Tonnage) is the most important one. This tonnage has nothing to do with weight but with volume. GRT indicates roughly the volume inside the ship that is available for the trade. Each ton is a 1000 cub feet which translates in 2.83 Cub m3. The space ratio given for each passenger ship mentioned; is this volume or GRT/BRT tonnage divided by the base capacity of the beds on board. As an example for the S class: 55,451 tons divided by 1266 lower beds, gives a space ratio of 43. As said it is not a perfect way to measure the old ships but in general it does give an idea how spacious, or not, the old ships were. Enjoy my company’s history with all its troubles and tribulations, highlights and dark days. 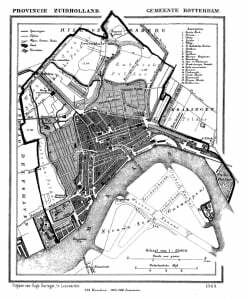 A map of the Port of Rotterdam from 1865 showing the river Maas flowing through it. From the 17th century onwards there had been a rivalry between the cities of Rotterdam and Amsterdam. A rivalry that still exists until the present day; although nowadays it is confined to soccer matches between the two cities teams. In the 19th century, the rivalry was in commerce. Rotterdam although located on the river Maas was hampered by inadequate connections to the sea, (The Maas and other rivers were too shallow for most ships) and thus for shipping companies Amsterdam was the most logical place to be based and to trade from. The local Rotterdam merchants did not like this one bit and were determined to have a big port as well. The Dutch government refused to invest in a direct and better sea connection as it did not see a need for it; they already had Amsterdam. The Rotterdam merchants wanted a good sea connection first, before they made any investments in shipping. The Dutch government indicated that they were not going to do anything until the port of Rotterdam had some significance. This catch 22, lasted for a number of years but as Amsterdam was flourishing, The people of Rotterdam decided they had to do something. When the plans became more and more definite, the Dutch government finally decided to get going as well and between 1868 and 1872 a new exit of the river Maas was dug to the North Sea. It was called the Nieuwe Waterweg or New Waterway. One of the results of this decision was to establish the forerunner of the Holland America Line. In 1870 a group of Rotterdam Entrepreneurs met and founded the C.V. Plate Reuchlin & Company with the aim to operate a regular Trans Atlantic Steamship Company from Rotterdam to the New World. A C.V is a Dutch form of a limited, private, partnership. The official date was the 8th. of February 1871. The company ordered two ships from Scotland. One might ask: why order new ships; why not obtain 2nd hand ones and see if the venture is successful? Well, steam propulsion and steam ships were still in its infancy and thus there was no second hand tonnage available that could fulfill the wishes of the new company. There were sailing ships aplenty but not steamships. Also the Dutch shipbuilding industry was mainly focused on building wooden sailing ships and had no expertise available to built steamships of iron. Therefore the company had to order in Scotland. These three dignified gentlemen here were the key players in this operation. To the left the Viscount Reuchlin who was a Rotterdam broker and involved in the shore operations of the new company. As an interesting detail, his son perished on the maiden voyage of the Titanic, while he was checking out the ship on behalf of Holland America. In the middle is Mr. Lodewijk Pincoffs. The latter was an entrepreneur who was involved in all sorts of shipping and very powerful in Rotterdam. However later it was found out that he had been “cooking the books”, so he had to flee to the United States. To the right Mr. Plate who headed a brokerage firm and supplied cargo. A painting of the Rotterdam I in the colors of C.V. Plate & Co.
As said, the company ordered two ships: the Rotterdam and the Maas, the first named after the home city and the second one after the river that flowed through it. However the name Rotterdam also comes from a river. This is the small river Rotte; where a dam was established in the 11th. century and around which the hamlet Rotte-a-dame grew. 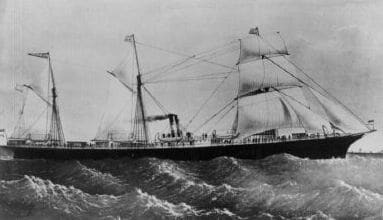 The Rotterdam (I) after having been delivered left on 15 October 1872 from Rotterdam for New York. It carried 70 passengers and 800 tons of cargo. (Mainly tulip bulbs and Dutch Gin) The ship was by no means full as there was not much interest in traveling with the new company, due to the lateness of the year and the subsequent expected bad weather on the North Atlantic. The Rotterdam was supposed to have been delivered about six months earlier; in time for the summer season but a strike at the shipyard of Napier & Sons in Scotland had caused a delay. Thus it was not a very good start for this venture and the whole operation was a gamble to say the least. 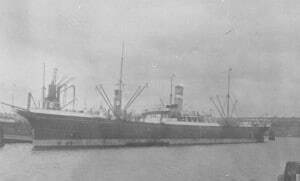 The Rotterdam (I) had a size of 1700 tons, a length of 269 feet and a beam of 35 feet. Official capacity was 8 passengesr in First Class and 288 Steerage, which gave it a space ratio of 5.5. It was not easy to get the company going. Apart from the problem of the ships reaching the centre of Rotterdam because of the shallow rivers; there was also the problem of the international competition and the lack of help from the Dutch Government. The Dutch government refused any help whatsoever. While other country’s helped their major shipping company’s with Navy grants, (so that the ships could be used as warships in time of need) or with postal contracts (carrying the nations mail on a own flagged ship) the Dutch government preferred to stay out of it completely. It was not until late in 1909 that the Holland America Line obtained a postal contract from the Dutch Royal Mail. Until that time, they had preferred to send the mail by English carriers as they were cheaper. The Dutch do like bargains…………….. The competition was fierce. Neither the Germans nor the British liked the idea of another upstart in a market that was already getting more and more crowded. Most of the German and British company’s had help from their national governments and were serving a much larger hinterland. The Netherlands was in 1870 only a small and sparsely populated country; with little or no need for international passenger travel. Therefore the company had to find most of its passengers and cargo from area’s outside the Netherlands. Still there was a possibility for the company to survive as long as it could offer the same service as the competition and that meant expansion. Expansion could only be financed with money from the outside and to obtain that money the company went public. On 18 April 1873 the Netherlands American Steam Navigation Company or NASM (Nederlandsch Amerikaansche Stoomvaart Maatschappij in Dutch) was founded. Within no time everybody called it the Holland America Line but that name was not officially adopted until 1896. The extra money was used for building more ships. Holland America keeps this date of the 18th of April as the official founding date of the company. It adopted the colours of the city of Rotterdam, the green, white, green, as their house colours on the ships funnel and the letters NASM would also appear on the white band of the house flag. A North Atlantic crossing in those days was not exactly a cruise. The ships were small and the North Atlantic weather often ferocious. Traveling was still an adventure, not to be undertaken by the faint of heart. It was not usual that presentations were made to the captain at the end of a crossing, by grateful passengers, for having been taken safely to the other side. As you can see the deck space on the earlier ships was not that large. The above photo shows the first class deck of the steamship Maas (I). 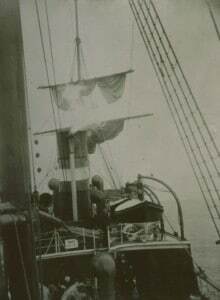 Soot from the funnel blows over the deck; sails were in use to save fuel and the open decks are cluttered with deck machinery and rigging. Class distinctions where in force, even with the small amount of deck space available. The first class having deck space on the higher decks (See the little sign on the railing) and third class, being the immigrants, on the lower decks. In bad weather these lower decks where often awash with overcoming sea water and then the immigrants would then be kept inside. The second flagship of the company was the Rotterdam of 1886. She could carry 87 First, 70 Second and 650 in third class. The ship was twice the size of the first Rotterdam and formed part of a group of seven ships that the company took over from the British Maritime Trust. This trust was an English investment company that built ships for their own account. These were rented out, chartering as it is called in the Maritime Industry, and sold on if the price was right. All their ships started with the prefix British and this Rotterdam, when built in 1878, was called the British Empire. Note the open bridge and the way of loading cargo. The space ratio was a whopping 4.1. The latter due to the high number of emigrants carried in a very small space. This ship also had the honor to make the company’s first cruise, to the opening of the Kieler Canal in 1895. This was a canal that Germany built to have a direct connection between the North Sea and the Baltic Sea, without having to go around Denmark. Especially handy for the German Imperial Navy in case of war…………. Captain Bonjer, the company’s first commodore. 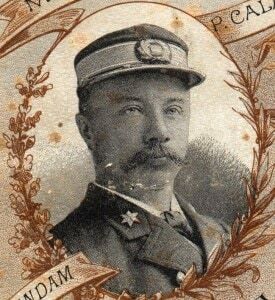 Captain Bonjer, was the first HAL captain who made 100 crossings and to celebrate this feat was appointed Commodore of the company in 1893. If you look at his hat, you can see the commodore band. In those days the officer’s stripes were not on the arms or on the shoulders but around the cap. After Captain Bonjer, the honorary title of Commodore was given to the most senior captain in the company. Most of the time the person how was the longest in service of the company, not necessarily the oldest. HAL kept this tradition until 1968, when it was decided that this old North Atlantic tradition did not fit in the company’s main focus of being a cruise operator. By 1896 the company had changed it’s working name to Holland America Line. 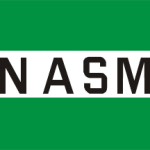 The NASM name still remained on the Stock Exchange and as a matter of fact it still exist as such in The Netherlands until today. However it is now an investment -only- company. In 1898 the company celebrated its first 25 years and could proudly announce that its ships had made in that period 1300 trips, had transported 90.000 cabin and 400.000 steerage passengers and 5 mln. tons of cargo. It also changed the colors of the funnel. This was due to the fact that Spanish American War had broken out and the company’s colors were similar to those of a Spanish company. It retained the Green-white-green bands; the colors of the City of Rotterdam but the funnel became yellow. These colors lasted until 1971 when the company went full time cruising. 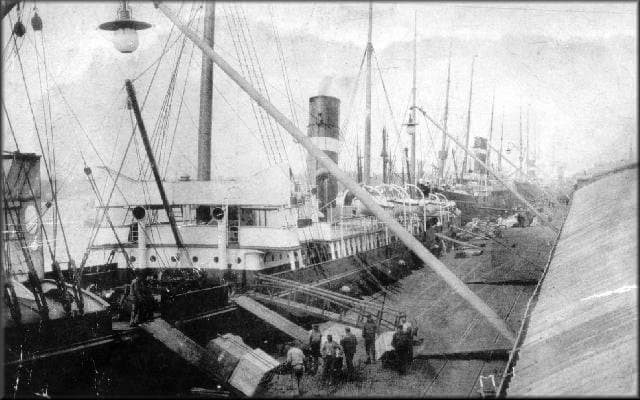 By 1900 the company had grown so much that it decided to have dedicated vessels for cargo and for passengers. Here we see the Zijldijk, one of the first real cargo-only- steamers of Holland America. Now the company’s naming policy was firmly established. Dijk names for the cargo ships and Dam names for the passenger ships. All the names used were taken from cities, villages or areas in the Netherlands, with a few exceptions ofcourse. The same names would be used over and over again. That’s why we now have a Rotterdam 6, a Statendam 5 and a fourth Veendam. The Zijldijk shows quite clearly in its design that the sailing days were not over yet; although steam was winning the battle over sail. It sported a bowsprit and a figurehead, same as the old clipper ships used to have. We see the ship here in the port of Rotterdam port, discharging American grain with the aid of a Grain Elevator. This was a machine sitting on a barge, based on the principle of the vacuum cleaner. The ships would anchor in the middle of the harbour (thus saving docking fees) and the Grain Elevator would be positioned next to the ship with the suction pipe going into the hold. In a very efficient, clean and quick way bulk products could be sucked out of the ships holds and deposited into waiting lighters alongside. It saved a lot of time and money compared to the old way of longshoremen placing sacks of grain in hoists and then swinging it ashore. 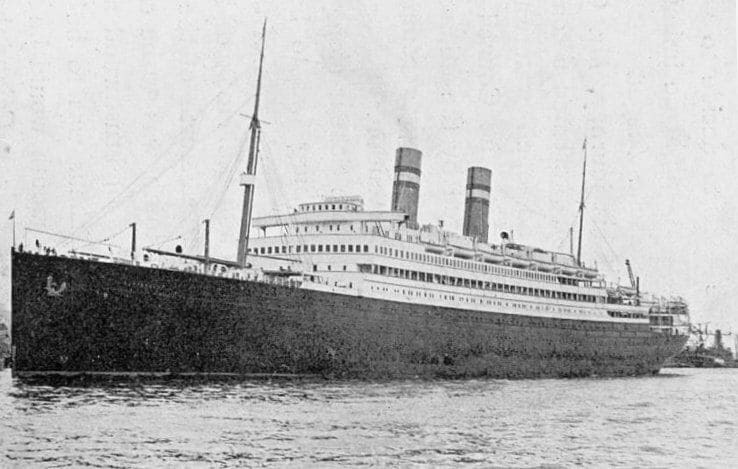 In 1900 the company ordered three new passenger ships; the Noordam, Rijndam and Potsdam. They only had a small cargo capacity and that was mainly used for carrying mails and high quality goods. The size was 12,527 Brt., Length 564 feet and the ship carried 286 first, 196 Second and 1800 3rd class passengers. Giving them a space ratio of 5.5. This trio of ships were real money-spinners for the company and helped the profit line considerably for the next 14 years. The Potsdam had a non-Dutch name for a change; it was named after the German town of Potsdam, a place just south of Berlin. This was done to have a ship with a name that was familiar to the emigrants that the company carried. 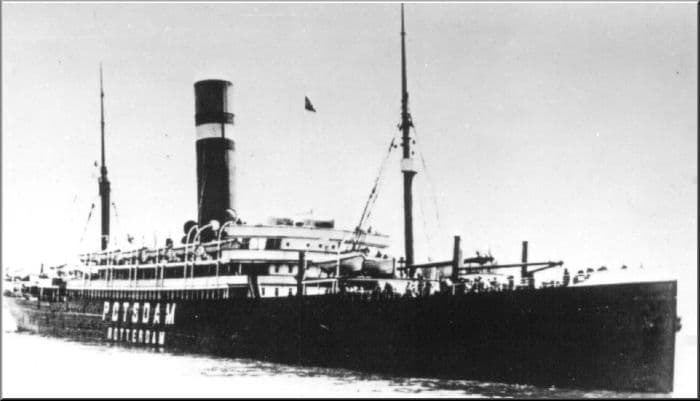 Most emigrants on the HAL ships came from middle and Eastern Europe and the name Potsdam would have been more familiar to them then Spaarndam which was another of the company’s passenger ships. Note the large funnel. As this ship was built at a different shipyard as its two sisters; the yard had made a bit of a blooper with the draft to the boilers. So the funnel was lengthened to a height of 26 feet to improve the combustion in the furnaces to produce the steam. It does not take too much imagination to understand that the ship’s nickname was Funnel-dam. On this photo we also can see the name and the homeport on the side of the hull and this indicates that the photo was taken in 1914. When Germany, France and England decided to start the First World War, the Netherlands remained neutral. To make sure that the German U-boats did not torpedo the Dutch-neutral-ships, the name and homeport were painted on each side of the hull. One only had to hope that the German U-boat commander would read before pulling the trigger. 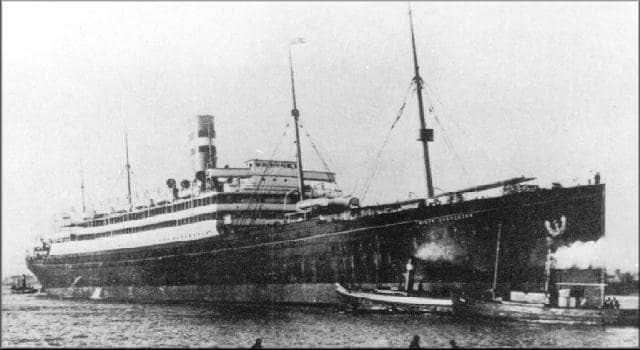 Due to the success of the three sisters from 1900, the company started to invest in bigger and more luxurious ships and the first one was the Nieuw Amsterdam (I) of 1906. Named after the original name of New York, when it was still part of the Dutch colonies. It was nearly double the size of the Rijndam of 1900 and very luxurious. The ship carried 440 First, 246 Second, 1078 3rd class and 1284 in Tweendecks. With a volume of 16.957 tons this gave a space ratio of 9.6 or 5.6 when counting tween decks. 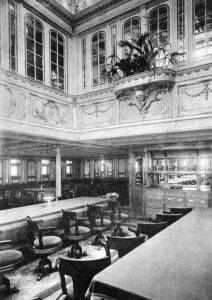 To the left, the first class dining room, which went two decks high and was covered by a glass dome, bringing natural light into the space. Please note the swivel chairs. As stabilizers did not come into existence until the 1950’s, the chairs were bolted to the deck. The guest would take his or her seat, swivel around and would then be firmly tucked in between the table and the back of the chair, while the ship happily rocked and rolled towards its destination. Cutlery and crockery was kept in place during rough weather by turning the table edges around so that there was a rim all the around the table preventing objects from sliding onto the deck. Wet table cloths also helped to reduce the movement of all that was put on the table. 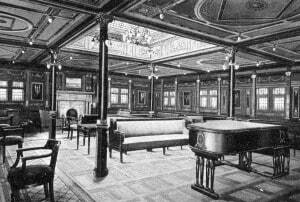 The First Class Smoking Room of the Nieuw Amsterdam, laid out in dark woods with the fire place being the focus of the room. Not unlike the Gentlemen’s club back at home, that the first class male passengers would have been used to. 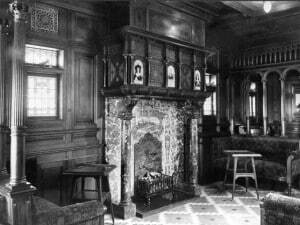 A significant issue here is that both rooms had an open fire; and that these fires were indeed lit in the evenings. A practice that luckily later on was banned by stricter safety regulations. I still find it amazing that only such a few passenger ships did catch fire in those days. All these open fires, surrounded by wood, while enduring the bad North Atlantic weather….. Although the ship carried the high number of 1078 in 3rd class and 1284 in Tweendeck, emigrants were not so bad off with Holland America. HAL was the first North Atlantic company who offered dining room style breakfast, lunch and dinner service. Until that time most company’s made the emigrants provide for their own food and eat it where they slept. The distinction between Tween decks and 3rd class was marginal. 3rd class still had cabins, although without facilities, and Tweendecks were removable dormitories in the cargo holds forward. That meant westbound dormitories were erected in the holds, be-Tween the decks of the holds and upon arrival New York, these separations were removed and the holds used for cargo eastbound. 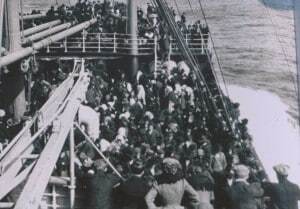 During nice weather all emigrants were forced on deck by the ships management, so the dormitories could be cleaned on a regular basis. If the weather was bad, which it quite often was on the North Atlantic especially in the winter, then everybody had to stay below. With most of these people located in the worst place of the ship (the bow) the atmosphere could be…………lets say quite distinctive. So serving meals away from the sleeping place made good commercial sense. Emigrants upon arrival at Ellis Island would compare experiences with each other and then write home, where other prospective emigrants were eagerly awaiting news from those at the other side. The next ship was the Rotterdam IV of 1908. Again the flagship of the company. Holland America was now becoming the trendsetter of the North Atlantic with innovative ideas. While the British and German companies went for speed and battled for the Blue riband of the North Atlantic, that is having the fastest ship in service, HAL went for affordable luxury big time. This Rotterdam was the first ship with an enclosed promenade deck with glass windows, so that the first class passengers could walk around the decks, even during inclement weather. This was considered opulence of the highest level and the second North Atlantic ship that had something similar to offer was the Titanic of 1912. This Rotterdam was also the last ship in the company fleet that carried sails. They were never used and were still folded away as new when in 1938 the ship went for scrap. It was also the first Dutch Royal Mail ship after the Dutch government in 1909 finally decided to carry the Dutch mails on Dutch ships. It had a volume of 24,143 tons and carried 552 first, 555 second and 2232 third class. (With 1064 of the latter in collapse-able cabins in the hold. So the hold was used westbound for emigrants and eastbound for cargo) 462 crew looked after a total of 3.339 passengers. Giving a space ratio of 7.2 or 10.6 if you discount the collapse-able tween deck cabins. If you want to see the ship in real life, please try the below link of youtube, for an old film fragment. Thank you for up loading your Outline of Holland America Line. Having had the opportunity to attend several of your lectures; it is nice to know I can go to your blog to refresh my memory with all the interesting stories you tell of HAL’s history. Dear Captain, Last year we did a wonderful 24 day cruise on Nieuw Amsterdam. There is a model of a sailing ship in a glass case on one of the public decks and I would like to know what the ship is its significance to Nieuw Amsterdam. Sorry for the delay in answering, only found your post back by scrolling through a lot of cruise remarks about other blogs, not mine. That model is a copy of the Haelve Maen (Half Moon) sailing ship which Henry Hudson used to discover the Hudson River and Manhattan. He did so on behalf of the Dutch Government/ Traders association. Because of the Holland – US relation it has always played a significant part in our company history. Most significant is the fact that is in our company logo. Here you see a large ship with two funnels (the Nieuw Amsterdam from 1938) and a sailing ship in front of it. That is the Haelve Maen. – Hoe lang duurde (destijds) de overtocht naar New York? The ss Rotterdam (IV) departed from Rotterdam indeed on 19 Oct. 1920 This was voyage 76 in command was commodore Jan Baron. The ship called at Boulogne Sur Mer in France and in Plymouth England and arrived on 29 October in NY. so a crossing including the two ports took 10 days. As far as the class configuration went, it changed a few times over the years but in 1920 it was: 432 First, 555 Second and 2232 Third Class. The ship went to a two class configuration in 1929 with 551 First and 1121 Tourist Class. This is where most of the class confusion comes from. I think this answers all your questions. anything else, please let me know. My father by the same name and my aunt: Margot H de Hartog apparently made several crossings to New York. My father’s second father was: Arie Toornvleit, apparently he as a senior executive of the HAL as a chief accountant. Is there any way that I can get more information about him? This would have been in the early to mid 20th Century. My father and I visited Rotterdam in 1987 and during the port tour, he pointed out an older style building with a Green dome like roof indicating that that was where his second father Toornvleit worked. see what I can find. There should be a personnel card and maybe more. Give me a few weeks and hopefully I will have something for you.